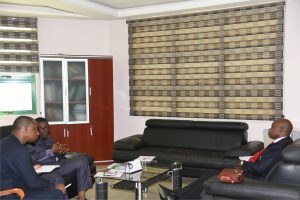 Nigeria National Accreditation Service (NiNAS) paid a courtesy visit to the National Biotechnology Development Agency (NABDA) on Thursday, 6th December, 2018. The purpose of the visit was to clarify the role of NiNAS in the NQI system and find areas of collaboration with NABDA. At the end of the meeting, both organisations were happy and willing to collaborate in moving the National Quality Infrastructure forward and by extension adding value to Nigerian products and services which will in turn improve the Nigerian Economy.